359th day of the year. There are then 6 days left in 2019.
on the 52nd week of 2019 (using US standard week number calculation). December 25, is the 1st of the 12 days of the Christmas Season (Twelvetide). December 25, 2019 is the 4th day of Hanukkah (Jewish Observance). 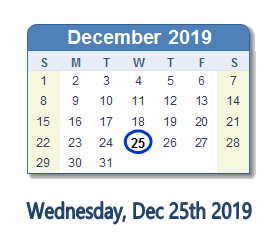 What happened on December 25th 2019?